Chad Reed has been on the move during the off season. 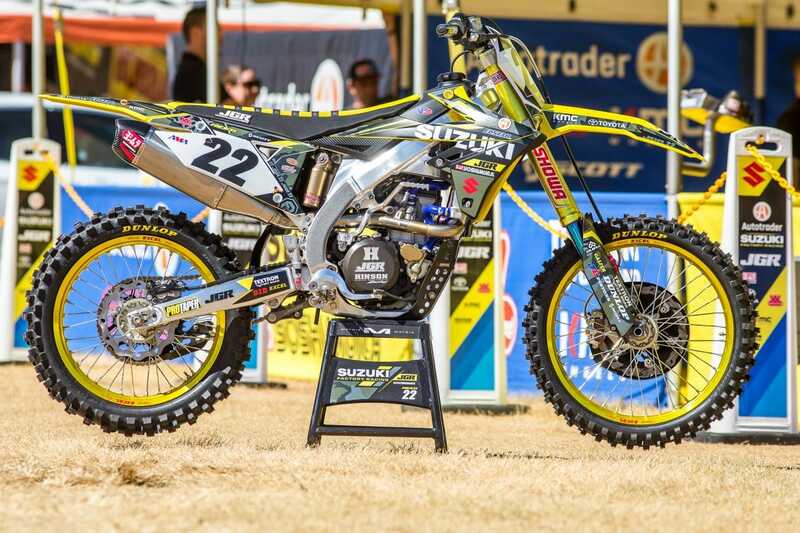 He sold his property, tested different brands, and eventually landed a spot at JGR Suzuki. Chad is looking very lean and fit compared to a year ago. Could we see the veteran racing up front this season? Only time will tell. Ben Schiermeyer took some time with us today at Sam Boyd Stadium and gave us all the details on Chad’s race machine. One thing Ben pointed out was the distance between Chad’s front brake lever and handlebar is very close. That is because Chad has smaller hands and prefers the brake pulled in. His clutch is in more of a standard position. 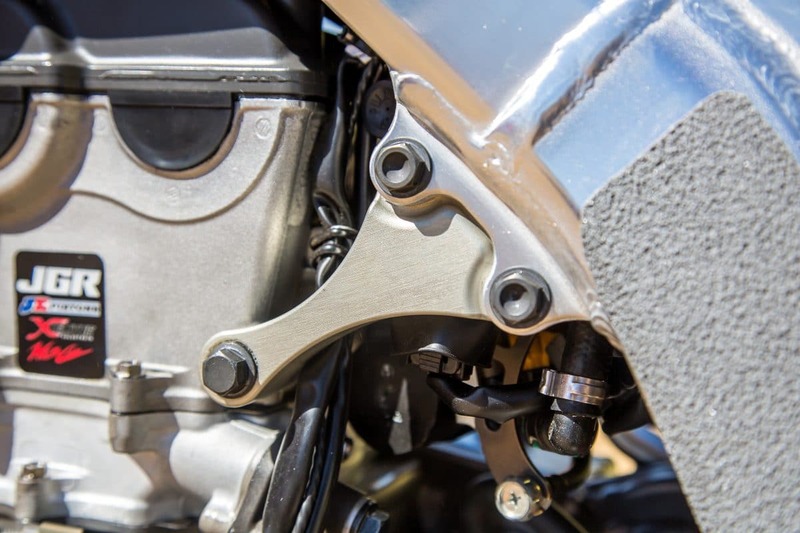 A factory Nissin master cylinder and factory Suzuki front brake lever are mounted to the Carmichael bend Pro Taper handlebars. Chad is running a rather deep holeshot device but does not run a 2nd option like some of the other riders do. 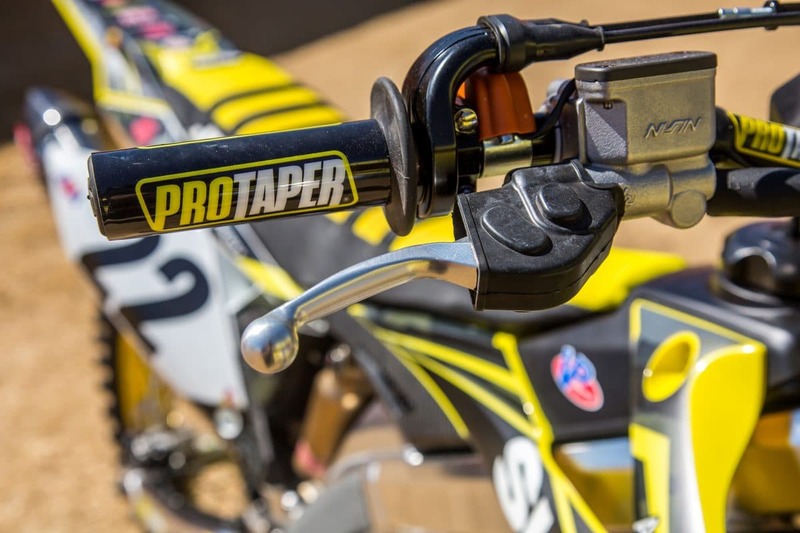 Chad is running factory Suzuki brake lines on his RMZ450. The suspension is works SHOWA that is a hybrid offering a spring and air for finer adjustments. The air actually helps with bottoming resistance late in the stroke. This is identical to the Pro Circuit team set up. The bars are low for a rider the size of Chad. You will notice in the bar clamp that there is a 2mm spacer to bring them up a little. 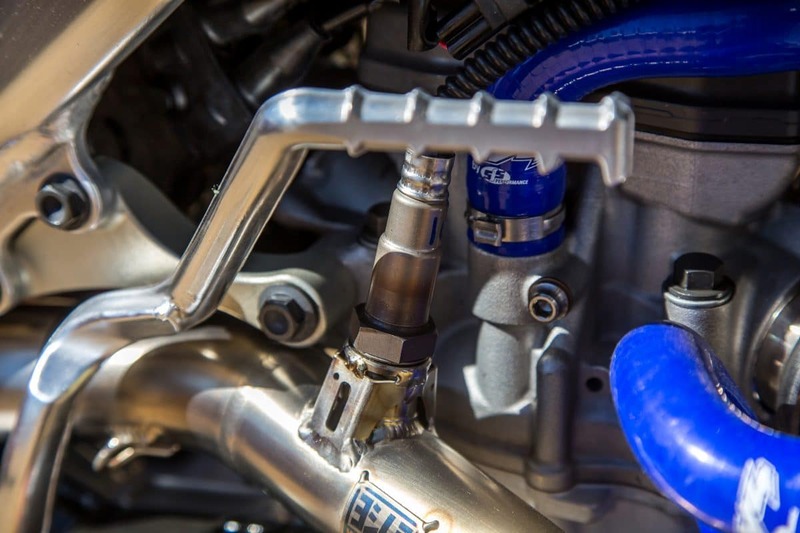 The steering stem, lock nut, and clamps are works Suzuki components. The clamps do have an offset but the team did not want to comment on actual numbers. The radiators are braced for strength in the event of a crash and welded at all the seams in house at JGR. The bread and butter. The engine. It is all done in house at JGR in North Carolina. 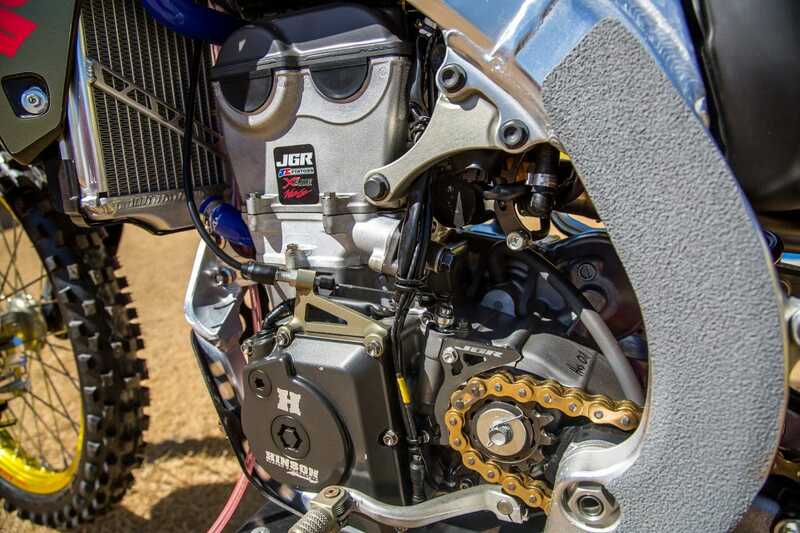 The team uses JE pistons, Xceldyne valve train components, and Web cams. 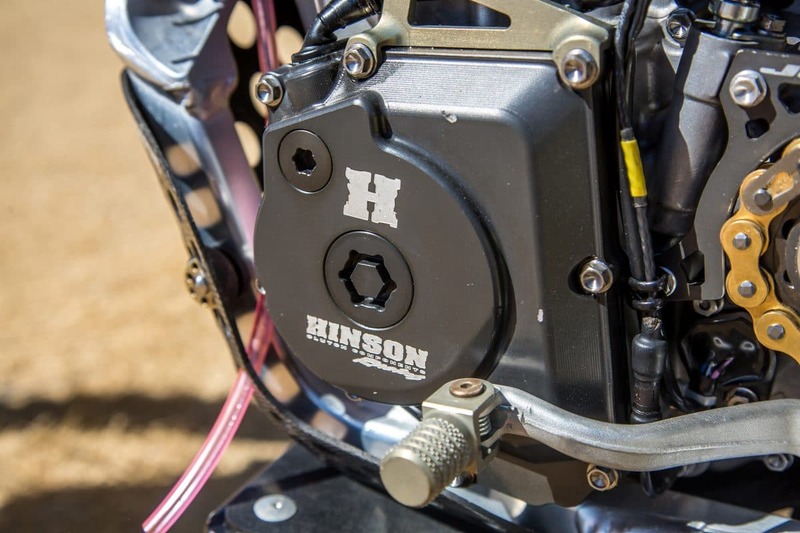 Hinson provides the clutch and ignition covers to JGR. Chad has stuck with the base setting on clutch and has not gone to stiffer springs. JGR always has some of the most unique looking motor mounts in the factory pits. 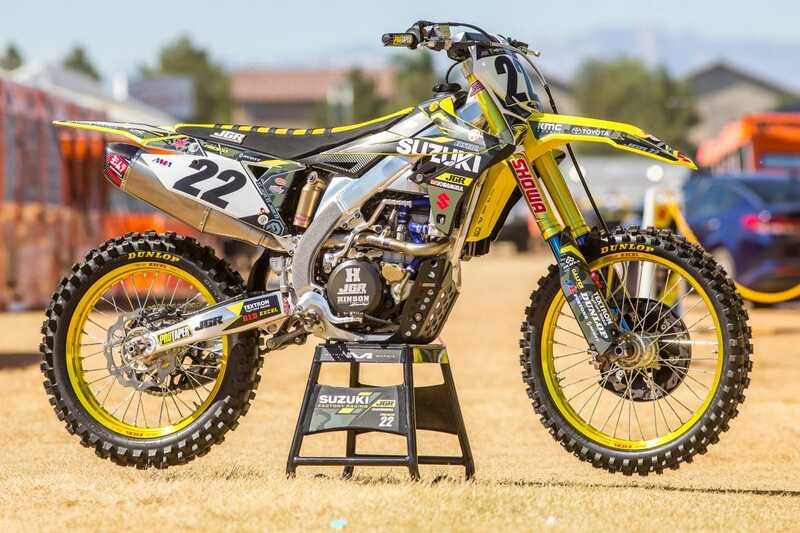 These are Factory Suzuki parts. JGR helps develop these parts. 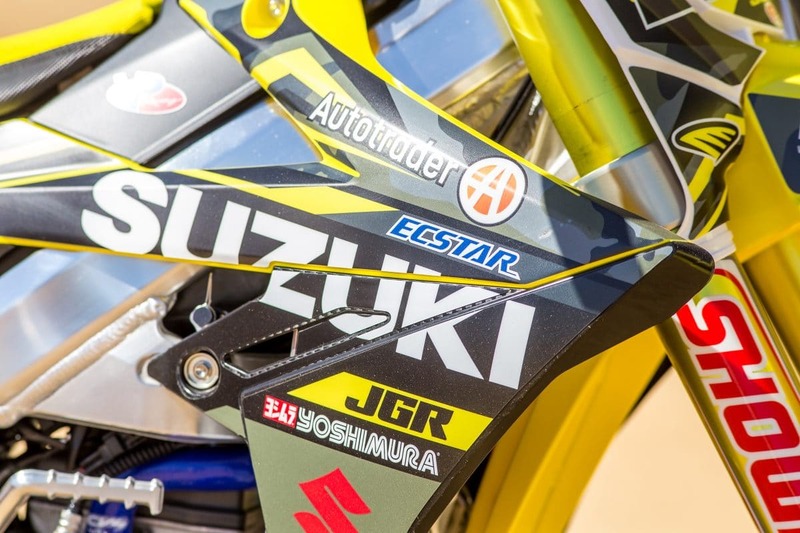 Suzuki will sometimes come up with an idea and have JGR actually make it for them in North Carolina. 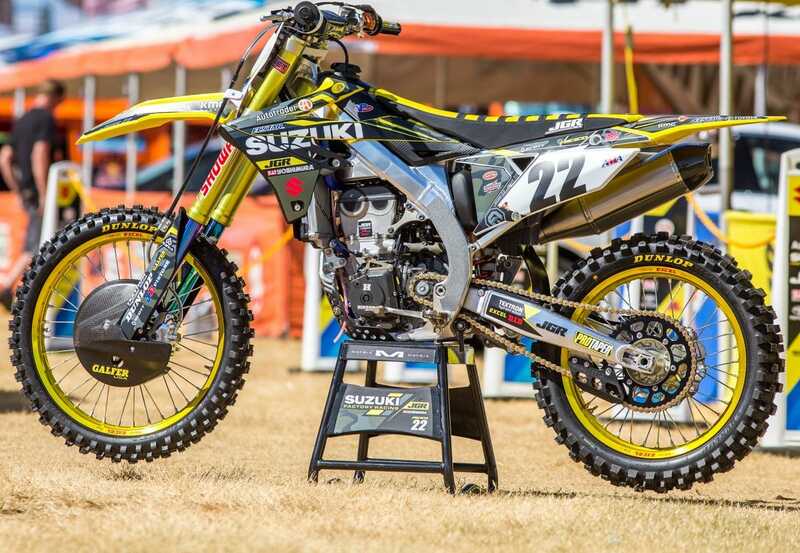 Suzuki Japan came out to test and actually spent 2 weeks on chassis adjustments in September for the upcoming season. 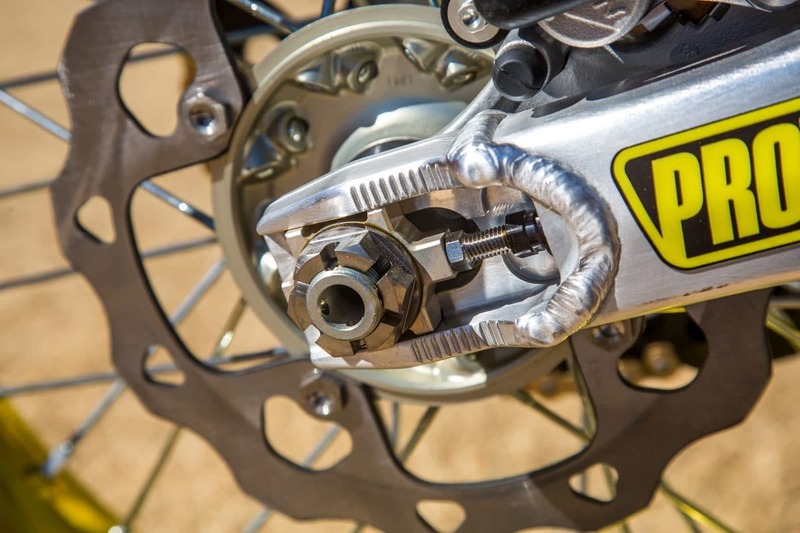 A works Suzuki clutch cable is threaded in versus being pinched. The bracket is made in house to hold the cable. You’ll also notice the JGR case saver in this photo that is made in house and available to the public for purchase. The shifter tip is a factory Suzuki piece and the actual shifter is a standeard piece. The tip is riveted on. The foot pegs are made in house at JGR. The mounts are standard. The team has a lot of positions they can chose from. 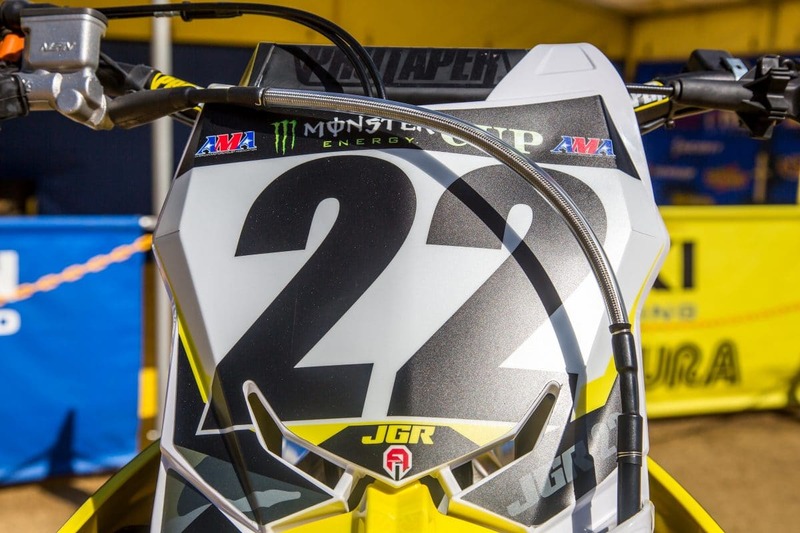 They have a wide range of sizes from Alex Martin to Chad Reed to Weston Peick and can make changes to accommodate each of those riders. 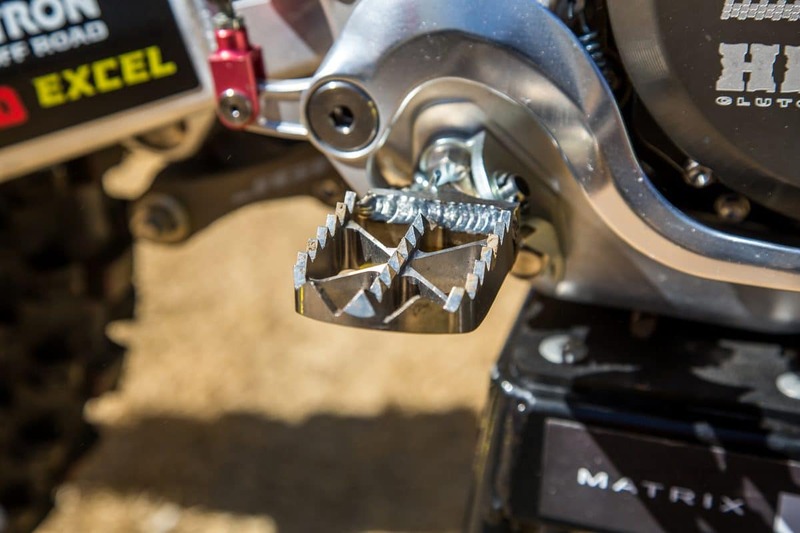 Chad is 10mm back and 5mm down on his foot pegs. For a shorter rider like Alex Martin, he is a +12mm up in position. All the data acquisition is made by GET. This is where the team can connect to the motorcycle with a computer and get information about it. 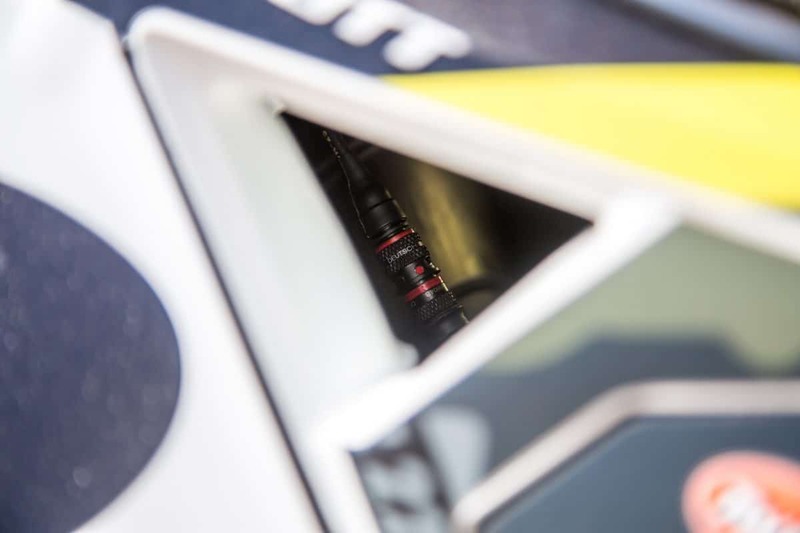 They are constantly running the data acquisition even during practice and on practice bikes. Air, fuel, oil temp, air temp etc is recorded and monitored. The team at one point was running data on the suspension but Ben explained it wasn’t something they ran all the time. He said that it would be something that the team would have to work on and could be improved. It would also need to be ran all the time to justify using it. 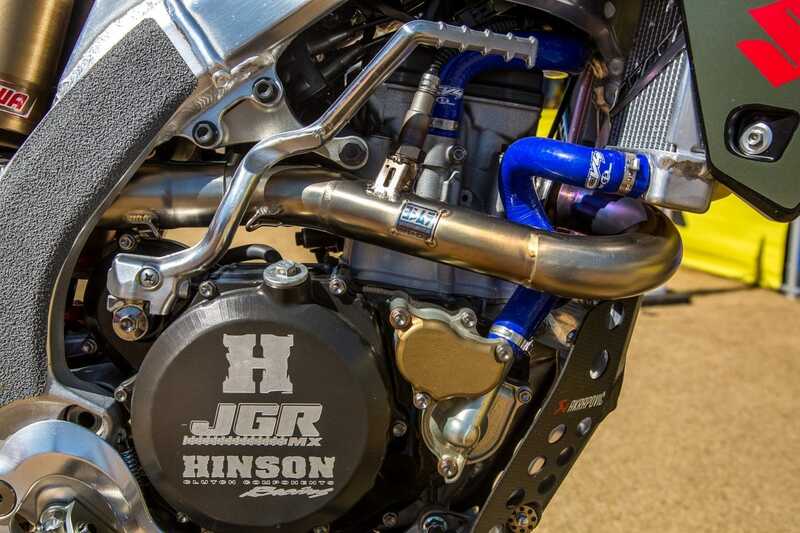 The sub frame is stock on the JGR Suzuki but is cut 10mm lower. The -10mm sub frame is a free preference. 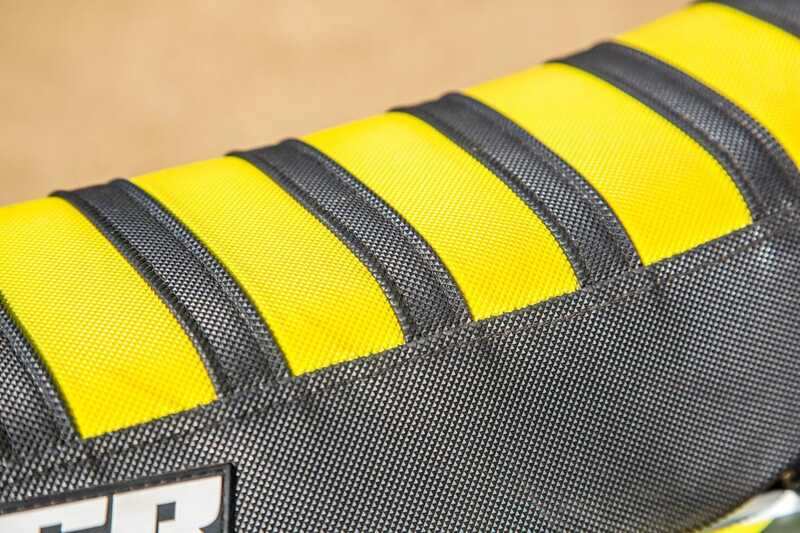 GUTS provides light weight foam and cover to the team. Chad prefers to use a seat that is worn in over a brand new seat when racing. These seats have to be broken in before he shows up to the race. 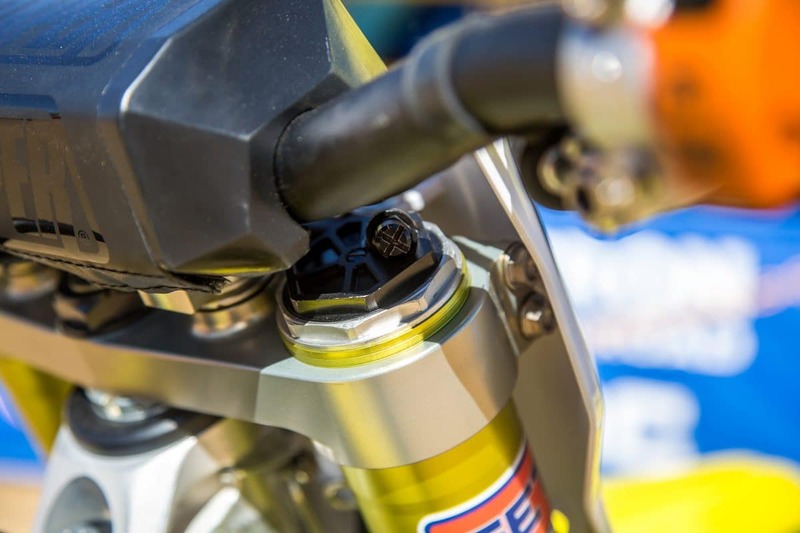 The BFRC shock is the stock shock that comes on the 2018/2019 RMZ 450. 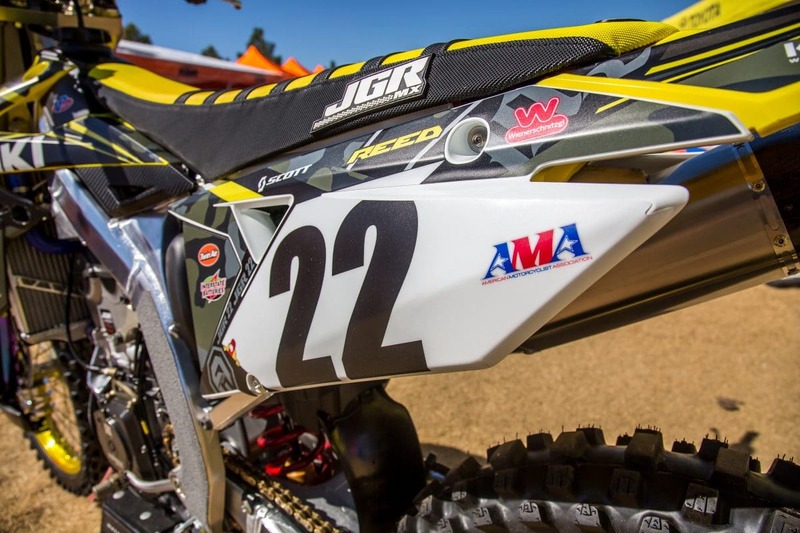 JGR did run a works version last year in Supercross and partially in outdoors. They stepped away from it toward the end of the season have not gone back to it sense. Ben explained it might be something they explore in the future if there is time to do some more testing with it. 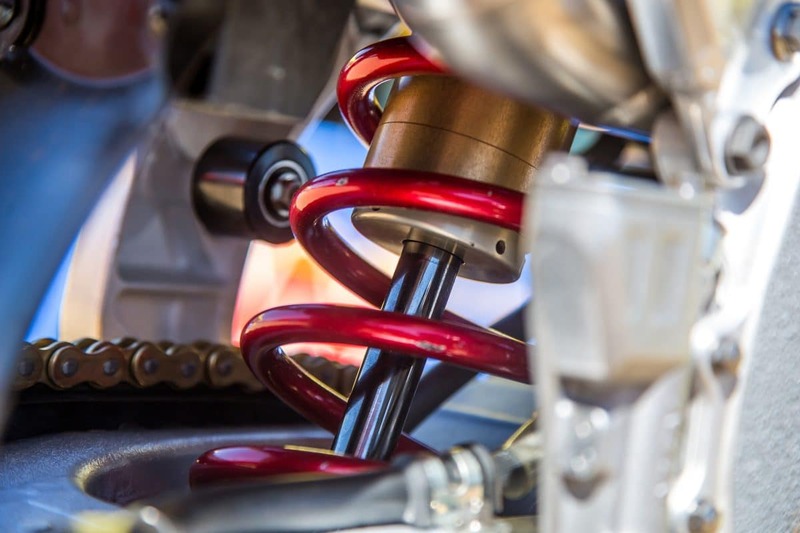 This shock is the more traditional works SHOWA shock that you would have seen on the 2017 model. Chad runs his wheel base longer for stability purposes. When testing with Hill, he preferred the motorcycle to feel shorter. 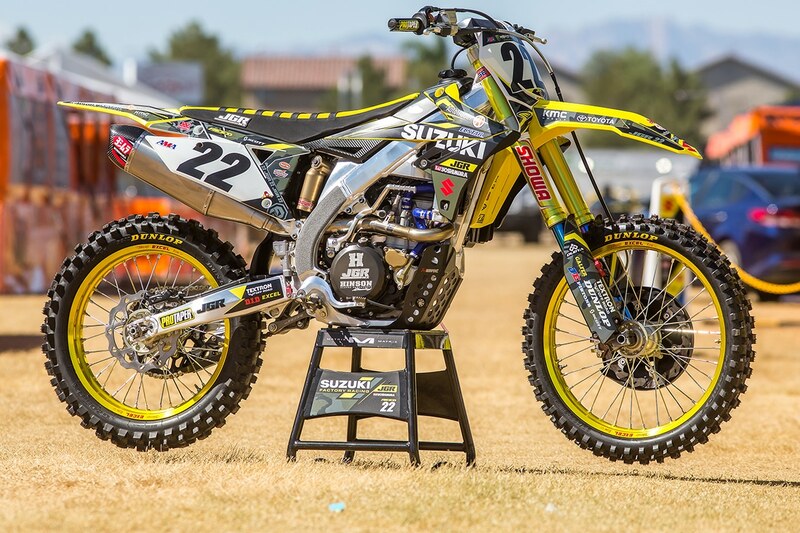 The front/rear axel are a works component from Suzuki. The front axel is actually wider to compliment the wider lugs JGR uses at thr front of the bike. 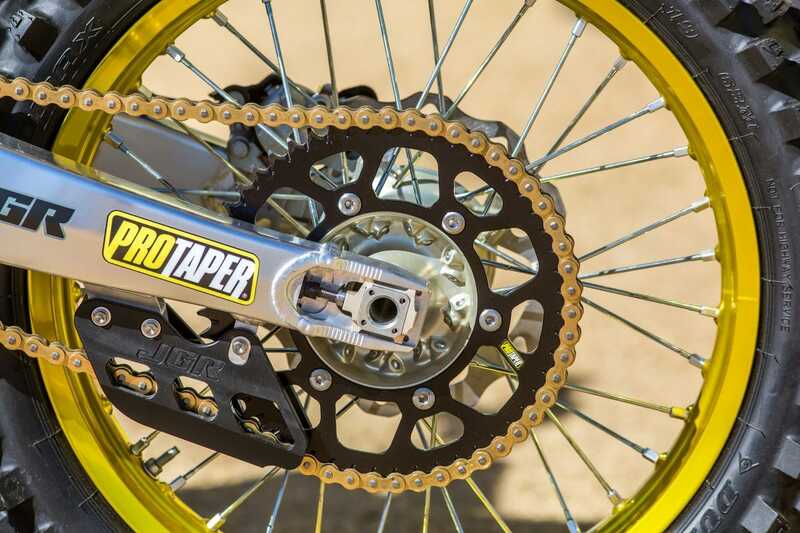 A DID O-ring chain and and Pro Taper sprockets are used for the drive train. 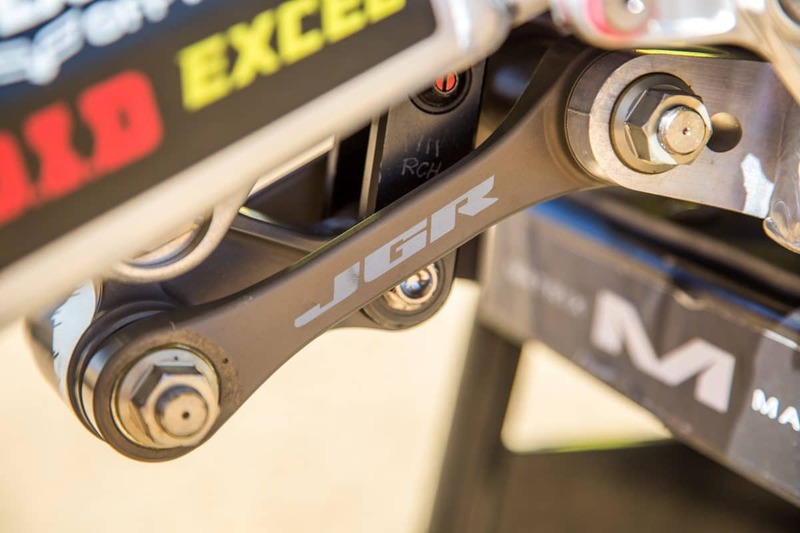 The JGR chain guide is made in house. 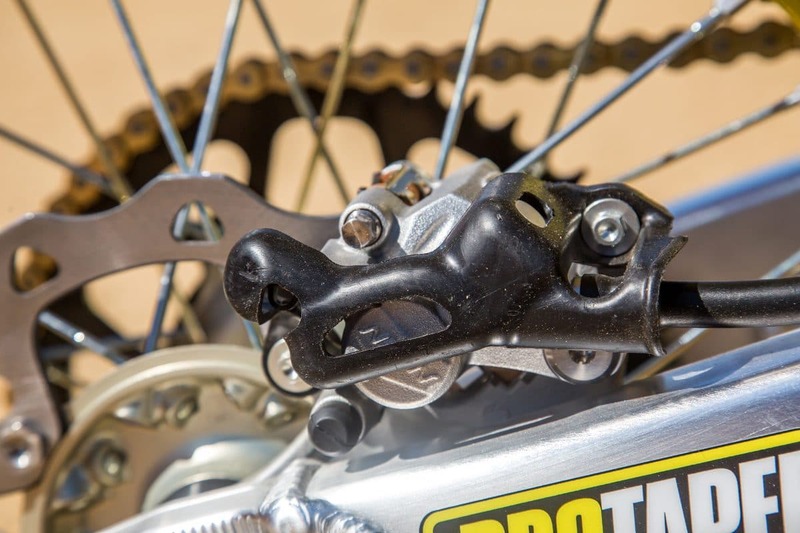 It is a little bit longer and keeps the chain more in line with the sprocket. 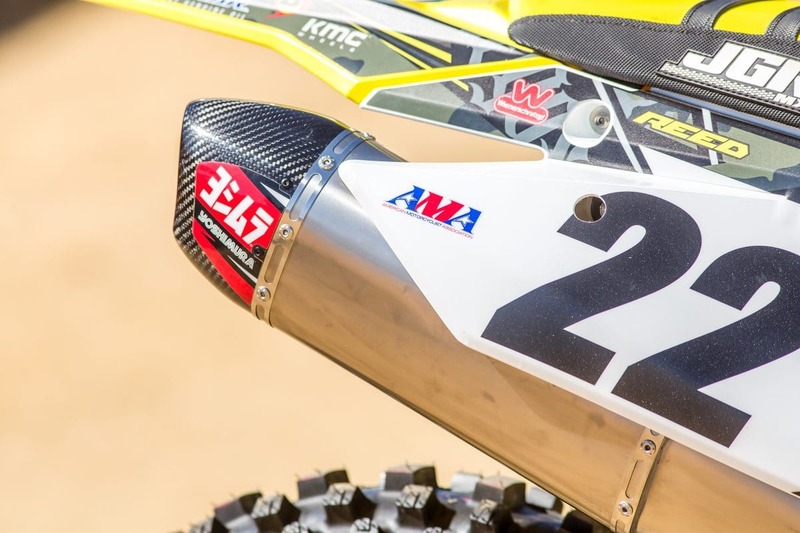 Yoshimura provides the exhaust to JGR and Chad Reed. They can and will make changes during the season to better compliment the engine package they are working with. The rear brake system is actually stock with a works Suzuki piston inside with holes drilled in it to keep release some of the heat. 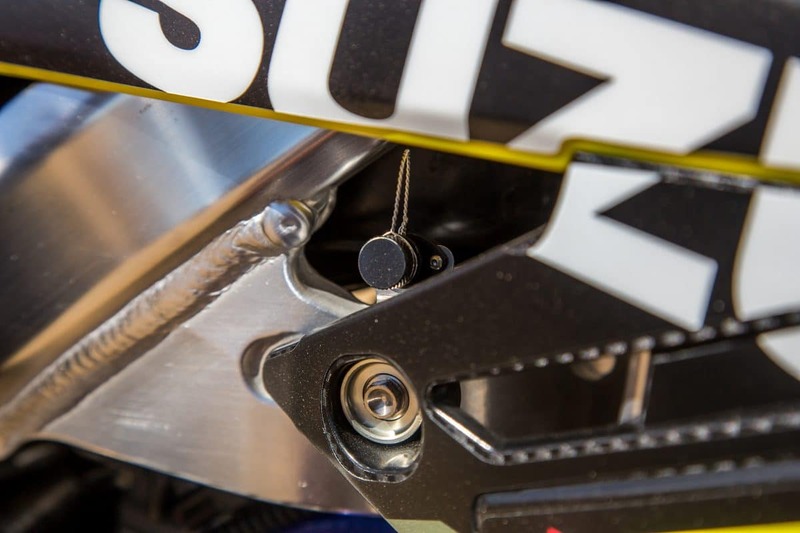 Factory Suzuki clevace, factory brake pedal and foot pegs made by JGR shown above. This caught our eye when looking at CR22’s motorcycle. The battery sits in the air box for all the data acquisition. 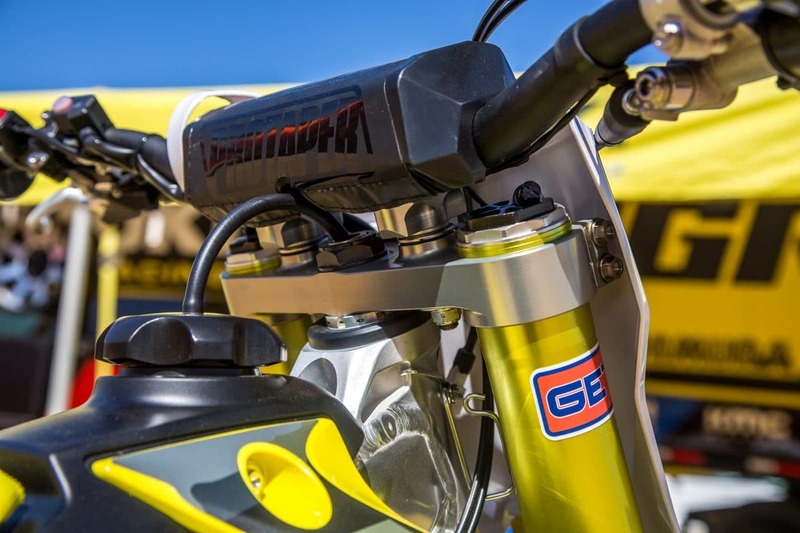 This battery does not rely on the motorcycle to be running for it to be used. It has its own power system. The team has the separate battery for data just in case of an issue, it wouldn’t effect the motorcycle running. 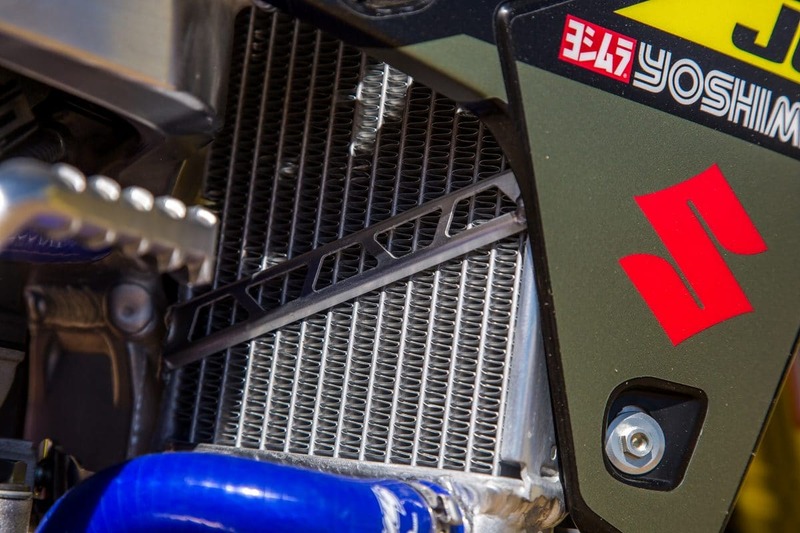 The O2 sensor “bung” is made by Yoshimura for JGR to collect data on the motorcycle for its air/fuel ratio. 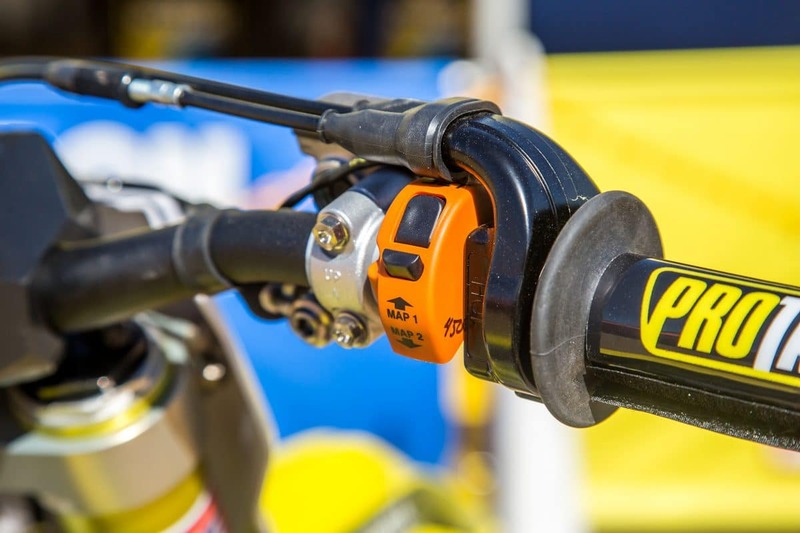 A GET map switch sits on the right side of Chad’s handlebars. If something comes up they can try different maps throughout the day. Chad prefers to stay with one map once he finds a setting he likes. Sometimes with altitude or temperature changes he may want to have a 2nd map to offset those changes. 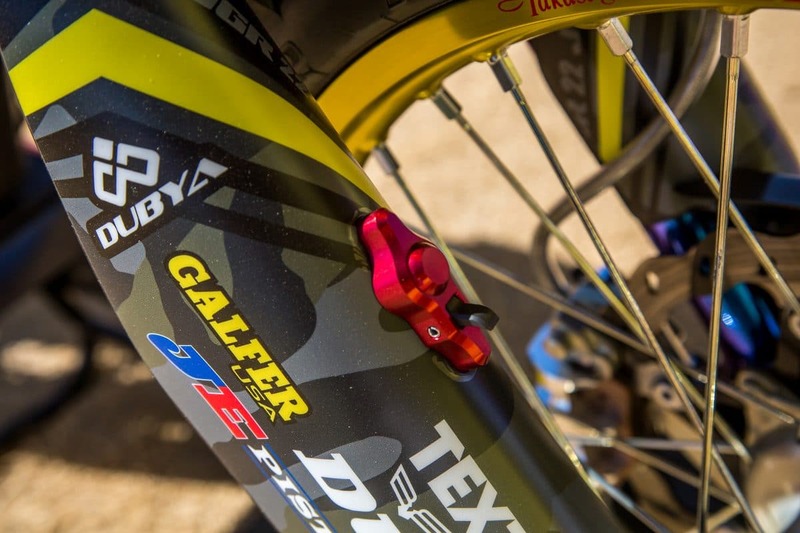 A JGR pull rod is installed on Chad’s bike and is adjustable. The knuckle is a works Suzuki part. Chad has his pull rod 1/2 mm shorter in length compared to stock. You have to take into consideration the works Suzuki knuckle before calculating the differences though. Titanium and aluminum are littered all over the motorcycle. It all comes from Suzuki in Japan. A lot of the plastics are where you will find the aluminum fasteners. 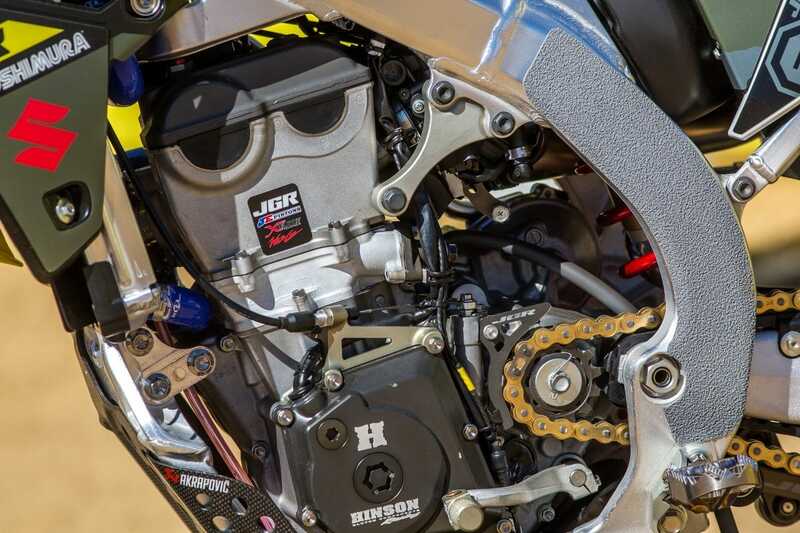 Titanium is used around the engine and for the most part on all the bike. 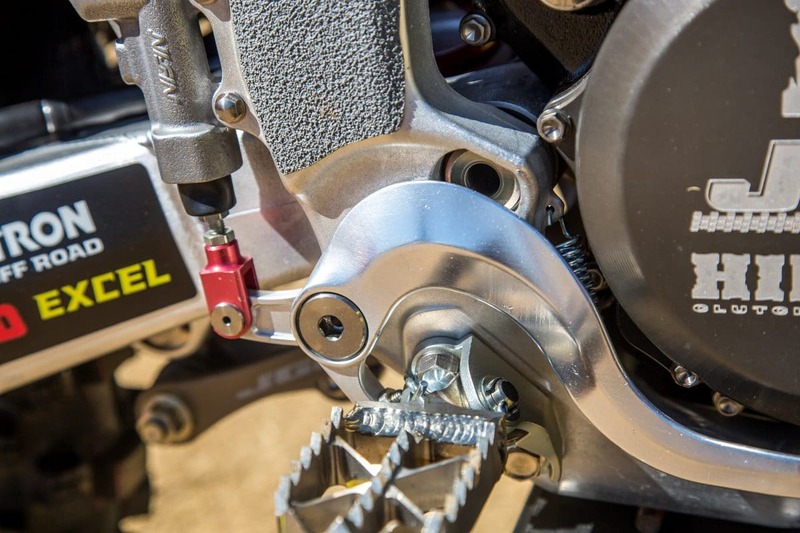 With axles and pivots there is a direct difference in feel when comparing titanium, steel, stock, works that the team has all available to them. They have an array of options to try for each rider. 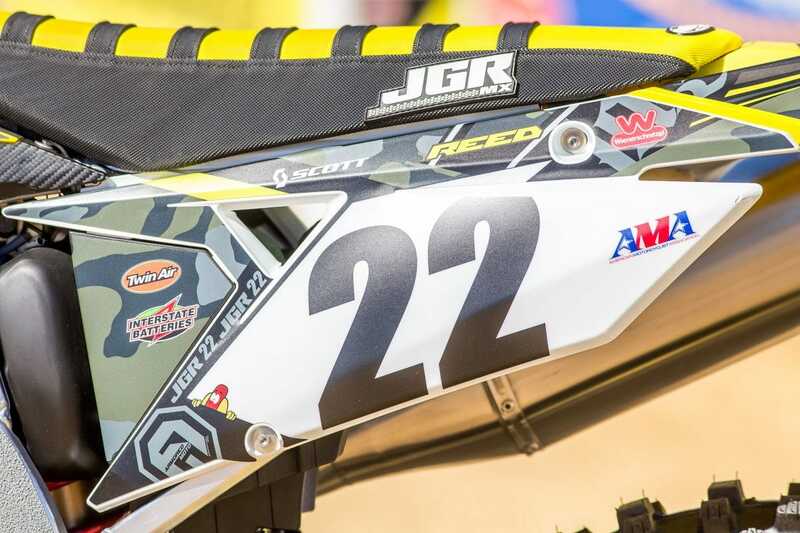 Armored Graphics do all the graphics for the team and are local to the JGR team in North Carolina. A matte black/camo scheme was used for the MEC race this weekend. Talking with Ben for a while we gathered that since Chad has been added to the team he has made an impact on testing for the entire group. Ben explained that they have had some long days at the test track because Chad will test absolutely everything and gives great feed back. Some things he found actually have helped other riders on the team. At the test track in North Carolina, Chad has helped the other riders by watching them on the track and making suggestions to their own personal set up. Chad gives the team an honest opinion and gives great feedback according to Ben. Chad made the change to running a 110 rear tire versus a 120 that he was using prior. 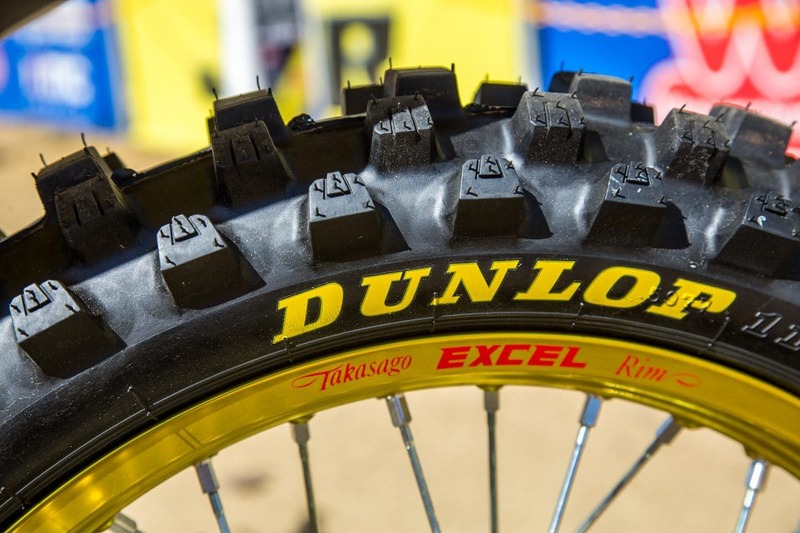 Based on feel Chad preferred the feedback of this size tire over the 120 in supercross. 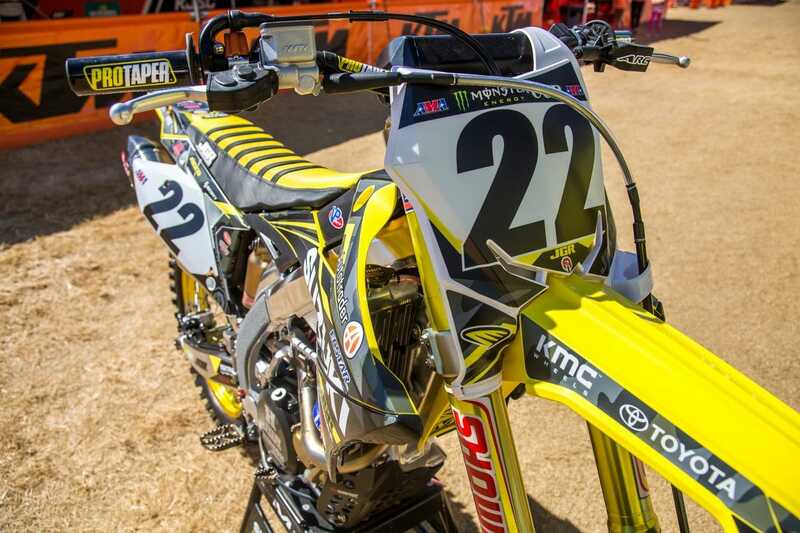 We look forward to watching Chad Reed Saturday night in Las Vegas line up with the fastest riders in the world. 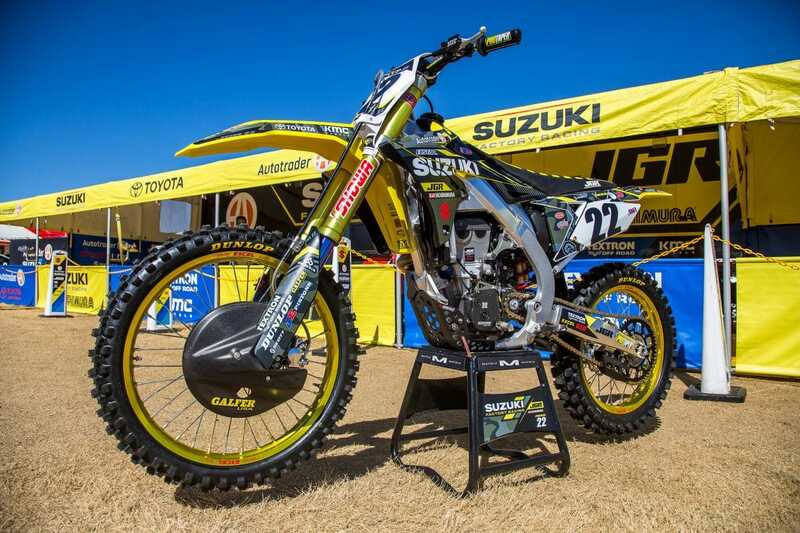 With his fitness elevated over last year and a bike he seems to be very comfortable on, Chad is sure to give the young guns a run for their money in the upcoming 2019 Supercross season.